There’s nothing that beats a warm summer afternoon, great music, great food, and a great setting. 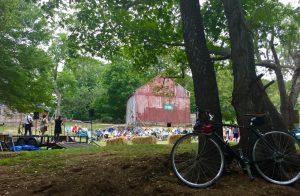 All came together for a perfect day at the Rettich Preserve, the Madison land Conservation Trust’s newest property in Madison, Connecticut. For one day’s effort, by a number of people, over $8000 was raised, and the property was visited by approximately 120 new visitors who had never been before. An architectural masterpiece? No, but one of the few remaining in a town that’s gone from agricultural to suburban over the decades. As the last remaining parcel of farmland, with a few farm structures, remaining along the Hammonasset River, it’s important. The property is gorgeous itself, but with the barn, it locks it down in people’s consciousness, as a farm, and that this town was once farmland. 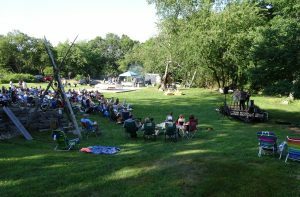 The event was a collaboration of Fire In The Kitchen Concerts, Field House Farm, and the Madison Land Conservation Trust. As the work was divided into various “captains”, it was easy to manage. One person was in charge of making sure the town was happy regarding any police or traffic issues (no problems, the town was happy without needing to supply police or monitor anything.) One was in charge of music and sound, one in charge of the demonstrations, and one on charge of food. That day, only a handful of volunteers above and beyond the captains were needed, specifically for check-ins and parking. As a debriefing, the only alteration might be to try to simplify the food. Field House Farms specializes in true farm to table food (all picked that morning) and they have the best local chefs from award-winning restaurants prepare it. The result is amazing food, but also a lot of stress and work. Fewer offerings might work, and also a menu where food is cooked to order, which would spare the work of estimating quantities, and potentially missing the mark.